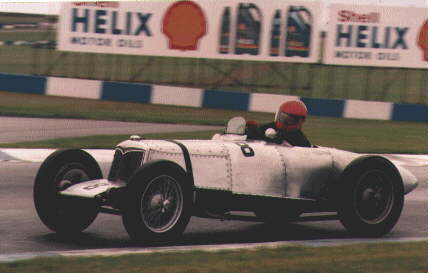 At the end of the 1933 season, so it is believed, Riley gave Dixon the 33TT 6-cyl chassis' from their cars, with some engines. From these parts, Dixon was able to build 3 'Specials', with only very minimal work. the main work was done to make the car lighter, largely by replacing parts with alloy replacements. He also made the car as low as possible, and therefore fitted a skid-pan from the Bulkhead to the back of the car. He also rivetted Aluminium hoops to the body, to make it act as a semi-stressed member of the chassis frame, so stiffening the whole car. The Engines he was given were standard 1486cc, with a 57.5mm bore. However Dixon progressively enlarged them to 1633cc/60.3mm and then 1808cc/63.5mm. Later again, a new crank was fitted, creating a 2-litre engine. This reputedly gave Dixon 170-175bhp, compared to the works 140bhp! The owner, of one of the cars, in 1989 still believed that 170bhp was about right, when running at 14.5:1 compression ratio, and using Methanol! The lefthand car is owned by Julian Majzub, and the one on the right is raced by the Gillies family. Out of the 3 cars Dixon built, only the 2 shown above are still in existence. The 3rd one hospitalised Dixon when he crashed it at Donnington in 1934, and it's believed that it wasn't rebuilt (Three are known to have existed, as all 3 were entered for that race). Even so, between 1934 and 37, Dixon and his Rileys were extremely succesful, and he only ceased racing due to some drink/driving convictions. His main successes were in high-speed long-distance handicap events at Brooklands, but his cars were also succesful on road-races against Monza Alfas, Bugatti T51's and ERAs. 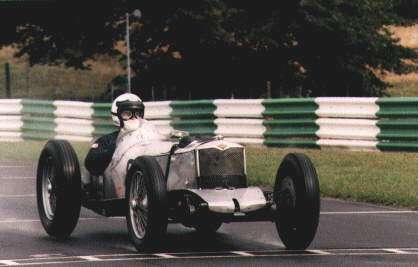 Dixon won the Brooklands 500-mile race in 34 and 36, and his other car came 2nd in 1937, he also came 2nd in 3 races in 1935. Dixon also obtained his 130mph badge in one of these cars, for lapping at 130+mph (the lap record was held at 143.44mph by a 24 Litre car). At the 1934 easter meeting at Brooklands, this car , which had a 1087cc engine, running on neat alchohol, won the sprint at almost 105 mph.....( I'm not sure of the distance for a sprint) he AVERAGED 104.8mph around Brooklands including stops for fuel, tyres etc! This beat a 4.5 litre Buggatti, and 10 litre Delage. This must say something about Freddie's tuning skills! This was probably the most important race in Britain in 1934 along with the TT. 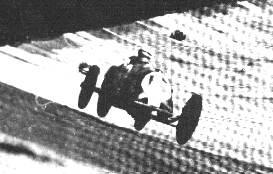 The Red Mongrel in the Brooklands BARC500. He then repeated this in 1936 sharing the car with C.E.C. Martin and averaging a staggering 116.9 mph! After 1945, Dixons Car (as opposed to his team-mates) was shipped to Australia, by it's new owner, where It was raced, and fitted with IFS from a competition Delahaye. The car was then sold again, and returned to England in the Mid-60's, racing it every now and then. The next owner restored it, although most of the work was merely cosmetic, and standard 'running repairs'. The car was then sold again, and the engine and gearbox overhauled, but the car is still thought to be one of the most original racing cars of it's era. This info is based on an article in Supercar Classics, Feb. 1989, by the Gillies family, and other information, mainly from Mark Ballard.